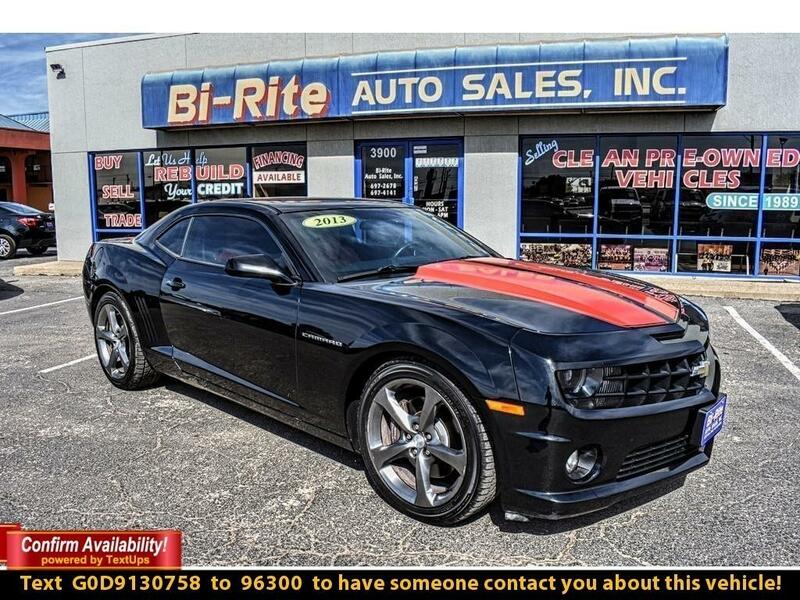 Meet Our 2013 Chevrolet Camaro 2SS Coupe is displayed in dramatic Black with Orange Racing Stripes. Powered by our 6.2 Liter V8 that provides 426hp while tethered to a smooth shifting 6 Speed Automatic transmission with TAPshift for on the fly gear changes. Enjoy precision handling, balance, near 24mpg on the highway and responsiveness of a performance-tuned suspension along with the exceptional stopping power of Brembo brakes and ultra-high performance tires. Take a look inside and you'll find that our 2SS Coupe continues its use of high-quality materials with content-rich appointments such as Orange/Black leather-appointed seating, a sunroof, and Head-Up Display. Every inch of its interior is designed to enhance your ride from the tasteful four-gauge auxiliary cluster to the Boston Acoustics premium nine-speaker stereo system, USB port and a rear camera that displays in the touchscreen radio. True comfort and convenience wrapped up in power. Chevrolet is solid on performance as you can see but also creates a very safe machine from a solid built to advanced ABS, airbags, and the ability to maneuver like a champ to avoid most issues. Don't delay... Print this page and call us Now... We Know You Will Enjoy Your Test Drive Towards Ownership! Please call us for more information.